This simple programmer will accept any device that's supported by software (eg, IC-Prog 1.05 by Bonny Gijzen at www.ic-prog.com). 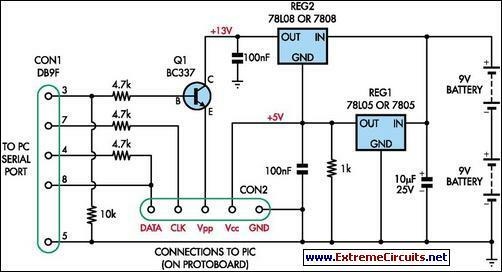 The circuit is based in part on the ISP header described in the SILICON CHIP "PIC Testbed" project but also features an external programming voltage supply for laptops and for other situations where the voltage present on the RS232 port is insufficient. This is done using 3-terminal regulators REG1 & REG2. The PIC to be programmed can be mounted on a protoboard. This makes complex socket wiring to support multiple devices unnecessary. 16F84A, 12C509, 16C765 and other devices have all been used successfully with this device.